Happy August! I cannot believe that I go back to teacher workdays in one week. I know I shouldn't complain since I am very blessed to have had an amazing summer off and to have been able to relax and enjoy time with Justin. The most viewed link of the week was Egg In The Hole Grilled Cheese from Five Little Chefs. Anyone who knows me knows that I consider Grilled Cheese to be my all time favorite food and I order in pretty much every restaurant I go to that has it on the menu so I love this post! My personal favorite features are a tie between two desserts (surprise, surprise!). First I picked these Really Fudgy Brownies from The Alchemist. They look so descendent and gooey deliciou. Plus who can resist a dessert with the words "really fudgy" in front of it? 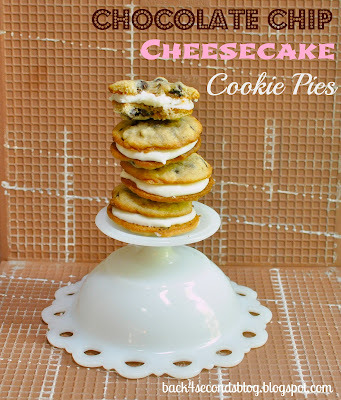 Next, I had to feature these Chocolate Chip Cheesecake Cookie Pies from Back for Seconds. I love cheesecake but I am usually way too lazy to actually make one. These are perfect and I feel like I will be making them for the fire station soon. Thank you so much for hosting the great party:-) Enjoy your last week of summer!!! I made the eggs in the hole grilled cheese yesterday! Thank you so much for featuring my Really Fudgy Brownies! I appreciate it! Today I've linked up my Summer Vegetable Tart. I hope you've had a great weekend and thanks for hosting! Thanks so much for the feature! You are so sweet!! Have a wonderful week!